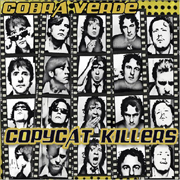 As the title suggests, Copycat Killers is Cobra Verde covering others' songs, killing the originals and allowing them to be re-born as new, rock songs. The hilarious opener, "Get The Party Started", a cover of Pink's pop-dance anthem, gets the party started indeed with a twisted rock version that does Pink like no other. Then, on New Order's "Temptation", Cobra Verde makes rock 'n' roll zeal and pop addictive-ness good bedfellows on this mid-tempo number. The Undertones' oft-covered "Teenage Kicks" gets a make-over too, though Cobra Verde, fans of the garage-pop that The Undertones did so well, don't stray too far from the original, adding beefier guitars and slowing it down, for the most part. Cobra Verde are one of the freshest rock voices out there today and with a covers album, the band showcases their versatility and diversity in influences. Sure, you can hear a good majority of these artists (The Easter Monkeys, The Undertones, New Order, The Rolling Stones, and Mott the Hoople) in Cobra's originals. But on one cover record, their influences become more than apparent as Cobra Verde pay homage and have fun with the music they love. I'll give it an A-.